(July 5, 2001) -- Two recent late night jets, and two post midnight/pre-6 a.m jets, at LB Airport exceeded noise maximums for those hours prescribed in LB's Airport noise ordinance, as measured by LB Airport's monitors. Two were charters; two were privately owned. LB Airport Manager Chris Kunze told LBReport.com he is reviewing the history and circumstances of each flight in deciding on enforcement, which in appropriate cases can include referral to the City Prosecutor's office under LB's noise ordinance. Three of the four jet flights involved neighborhood Runway 25R, a shorter runway used mainly by smaller general aviation aircraft and commuter flights. Runway 25R doesn't usually operate from 10 p.m. to 6 a.m. (meaning it should produce 0 dB noise in those hours) but served as a temporary alternative when the Airport's longer, main diagonal Runway 30/12 was closed from 10 p.m. to 6:15 a.m. June 26-29 for adjacent taxiway construction. Two of the Runway 25R noise events involved jet approaches at roughly 10:40 p.m.; a third involved a jet takeoff at 1:56 a.m. on 25R The Airport's noise monitors indicated all three Runway 25R noise events exceeded the maximum level allowed for the main diagonal Runway 30/12 at that hour. A fourth jet flight on July 2 at roughly 5:43 a.m., used main Runway 30/12 and also exceeded the allowed maximum at that hour. 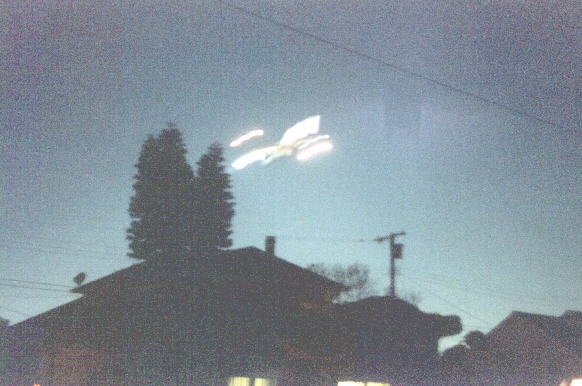 June 28, 2001, 10:40 p.m. Sequential exposure photos (viewed right to left) show descending Boeing 757 jet charter over ELB homes on approach to neighborhood Runway 25R, directed during temporary closure of main runway 30/12. Airport noise monitors say this flight exceeded the maximum level allowed for main diagonal runway 30/12 at that hour. On June 26 at roughly 10:40 p.m. an incoming Boeing 727 privately owned jet on Runway 25R registered 98.1 dB SENEL. On June 28 at roughly 10:40 p.m., an incoming Boeing 757 jet charter on Runway 25R registered 100.2 dB SENEL. 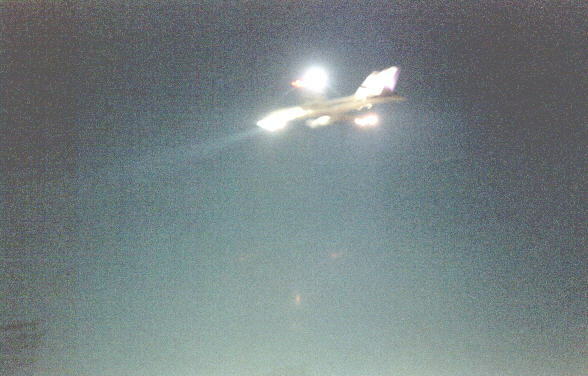 On July 2 at 5:43 a.m., a departing Boeing 727 privately owned jet on Runway 30 registered 98.0 SENEL. SENEL is a sound measurement in which the magnitude (decibel level) and the duration of the noise are factored together logarithmically. "Each 10 dB increase is doubling of perceived loudness...At the 85 SENEL the maximum noise level is twice as loud as normal speech and would require raised voice level to communicate. At 95 SENEL the loudness would be perceived as twice as loud again and would be comparable to shouting voice level." The Airport's acoustical consultant's memo added that 85 dB SENEL was the maximum residential exposure considered acceptable by Newport Beach city officials during their litigation over John Wayne Airport. The memo noted, "While individuals response to noise varies widely, one would expect a certain portion of the population to be highly annoyed at these noise levels." Runway 25R's approach aligns with Monlaco Rd. (between Wardlow Rd. and Conant Street) with single family homes stretching for miles from Clark Avenue to the San Gabriel River. Runway 25R's take off aligns roughly with 36th St. west of the airport over the Los Cerritos neighborhood adjacent to Bixby Knolls. Although nighttime and early a.m. operations are not common on runway 25R, they do occasionally occur in response to weather conditions, safety factors and the like (as directed by the FAA). LB Airport officials told LBReport.com that the overnight taxiway construction adjacent to main diagonal runway 30/12 was expected to end on the night-morning of June 29-30 but there may be scattered main runway closures for roughly ten more overnight periods during the next six weeks, including two 10p-6:15a closures on July 9 and 10. LB's noise ordinance gives City Hall two avenues to protect LB residents: one is a civil administrative mechanism; the other is an alternative enforcement procedure that carries potential criminal penalties. However, monitored noise levels alone are not determinative. Airport Manager Chris Kunze told LBReport.com he will review the histories and facts of each of the noise events and will pursue the alternative enforcement if he believes it is warranted under the circumstances of each flight. It is a misdemeanor, subject to the penalties applicable to misdemeanors, for the Owner/Operator of an aircraft to exceed any established SENEL limit without a reasonable basis for believing that the aircraft employed would comply with the applicable SENEL limit. Owner/Operators of scheduled Flights utilizing aircraft which comply with the standards of FAR Part 36 Stage 3 shall be presumed, for the purposes of this Section, to possess a reasonable basis for believing that such aircraft can be operated in compliance with applicable SENEL limits. Mr. Kunze told LBReport.com that depending on the circumstances and history of the specific flight, correspondence might precede prosecution. If the Airport Manager were to refer a matter for possible prosecution, the decision on whether actually to proceed with a criminal filing would be made by the City Prosecutor's office.